I can eat Dosa all days, any time of the time and everyday. I can write a book on my passion and experience with Dosa. Amma tries out many varieties of Dosa, especially for me. And my all time favorite dosa variety is Adai. The thin crispy Adai with tempting Coconut chutney is just out of the world. Unfortunately my hubby dear and Dad don't prefer this much. So we make it whenever they don't have food at home. 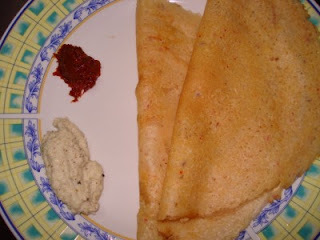 Yesterday, I made Adai for dinner and convinced hubby dear that its not Adai but Dosa made from combi of pulses. He saw and said I cheated him, still after eating it said it was very tasty. Grind Rice first. It has to be little coarse and not a fine paste. Then grind all the pulses. Mix it to the rice. 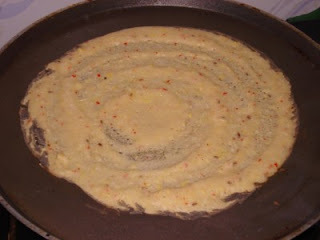 Heat a tawa and spread out one spoon of batter into thin layer. Add oil or ghee. Sprinkle cumin seeds on the top before turning it over. Cook on both sides and then take it out.